Linwood “Tick” Thumm as a young ensign in the U.S. Coast Guard. They were dubbed the greatest generation, and after spending an hour or so with Linwood Thumm, known more affectionately as “Tick,” it’s easy to understand why. His recollection of his service in the Coast Guard during WWII are as vivid as if he just left the battle. Humble about his service yet excited to share his memories, this is just a brief glimpse into the story of Tick Thumm. Thumm’s military service began in 1942 with the U.S. Navy, when he answered America’s call after WWII broke out. His service in the Navy, however, didn’t extend any further than the entrance process when, according to Thumm, he was turned down because he didn’t have three matching molars. Not willing to take no for an answer, Thumm turned to the U.S. Coast Guard.Shown here is an engraved sword owned by former Coast Guard officer Linwood “Tick” Thumm. The sword was a gift to Thumm from his crew of an 83-foot Coast Guard Cutter at the end of World War II.Having grown up on the water, Thumm figured he would take to the Coast Guard like the Wright brothers took to flying. After joining the Coast Guard and becoming a seaman 1st class, he tested for the Coast Guard Academy. Thumm’s proficiency in math paid off on the exam when he achieved a near perfect score on the celestial navigation portion. Having entered and successfully completed the program, he became an officer and was given command of an 83-foot cutter crew stationed at Naval Base Little Creek in what is now Virginia Beach, Virginia. Thumm and his crew spent the first part of the war escorting convoys along the Atlantic seaboard, mostly from New Jersey to North Carolina. During one of these escorts, Thumm and the crew spotted a German U-boat, and with the help of a few depth charges, sent the U-boat to its final resting place on the bottom of the Atlantic Ocean. A naval panel at Fort Story in Virginia Beach investigated the encounter, but only credited them with a possible kill – a categorization Thumm attributes more to jealousy on behalf of the navy than a lack of evidence. In his mind, Thumm didn’t need the Navy to confirm the kill – his crew found half of a German officer’s body in the water and that was good enough for him. 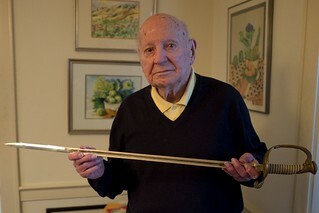 Linwood “Tick” Thumm displays a sword he received as a gift from his crew after they served in both the Atlantic and Pacific theaters during World War II. During his time in service, Thumm and his crew also saved the lives of quite a few allies. On one such occasion Thumm responded to an oil tanker that was ablaze. While other naval vessels feared an explosion and stood by, Thumm piloted his ship toward the burning vessel. The Coast Guardsmen under his command fashioned a net from sheets and blankets, caught the crew as they jumped from the burning tanker and brought them safely ashore. Thumm was awarded a commendation for his actions that day. Having done their part to protect the East Coast from German U-boats, it was time for Thumm and his crew to head to the other side of the globe where they prepared to take on the Japanese. In an effort to keep theirShown here is the official discharge certificate for Linwood “Tick” Thumm, an officer in the U.S. Coast Guard during World War II. Thumm was the commanding officer of an 83-foot cutter that saw action off the Mid-Atlantic Coast of the United States. morale up on the two-week journey to the Philippines, Thumm’s crew painted the ship. As the only cutter in the fleet with a two-tone paint job, it drew some attention. One fan of the newly painted ship was none other than Fleet Adm. William “Bull” Halsey himself. According to Thumm, Halsey visited the cutter twice and once took the cutter for a spin. Today, March 26th, Thumm turns 100 years old, and it is through this greatest generation that the legacy of the Coast Guard is able to continue today and will continue to do so in the years to come. Happy 100th birthday Tick. We salute you.